Refrigerators have certainly increased in cost over the last few years and when we take into consideration all the electronic and convenience features, it's no wonder. That being said, are you paying more for your refrigerator investment than you really need to? Features like through-the-door ice and water dispensers considerably increase the cost of this major kitchen appliance. There are things to consider when choosing a model with this feature to ensure that the convenience will outweigh the additional cost and trade-offs of this particular design feature. A refrigerator with water or ice dispensing requires plumbing installation. Can you locate the appliance where it can be plumbed into a water line? You may want to budget or consider who will or can do this work to complete the installation. An ice dispenser reduces the freezer capacity of the refrigerator. This trade-off is probably worth the convenience of ice cubes on demand especially if you live in a hot climate, entertain often, and have more freezer storage elsewhere in the house. A through-the-door water or ice dispenser reduces even further, the amount of freezer space in a side by side model or refrigeration compartment in a french-door refrigerator because you lose the door shelf/bin storage space. If this is not a concern, water dispensing can be very convenient and can even encourage your family to drink more water. Water quality may need to also be considered. Do you currently need to filter the quality or improve the taste of your home's water supply? You may want to consider water dispensing refrigerators that have added filtration features. Otherwise, if you tend to use bottled water due to the taste or quality of your local water, you may not reap the benefits of onboard refrigerator water dispensing. If your local water supply comes from a lake or well source, filtration may be required not only for water quality but to prevent ground sediment accumulation which can cause problems in your dispensing unit. 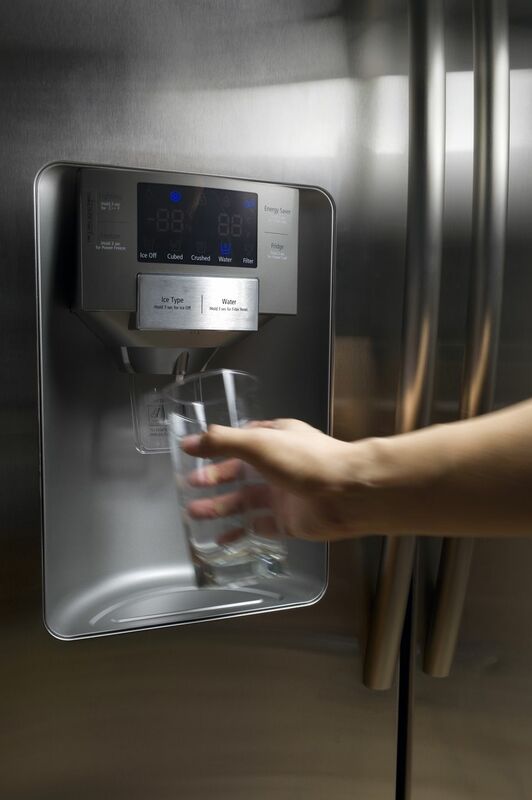 Although there are a few, most refrigerator water dispensing units do not allow sufficient room height to accommodate single-sized water bottles but are designed generally for that quick glass of water. Having easy-to-reach quick water dispensing on the outside of your refrigerator can reduce the risk of pouring spills. These features will increase slightly the energy use of your refrigerator, but since there is no need to open the refrigerator door to retrieve a water pitcher, you can actually save on energy costs in the long run. If you pay for water by the gallon, a water dispenser will eliminate running the faucet for several seconds to draw cold water, reducing the amount of water you use in your home. Are Wood Kitchen Countertops Worth the Cost and Inconvenience?